Get REFRESHED. Get INSPIRED. Get AWAY! 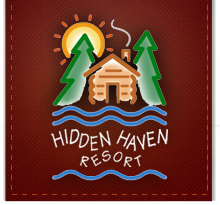 Hidden Haven Resort is a quiet, secluded, Minnesota family vacation resort set amidst the tall pines, birch and maple trees of Minnesota's Northwoods. Our 30-acre family resort is located 12 miles northwest of Grand Rapids, MN, on the northwest shore of Big Bass Lake in beautiful Itasca County. We offer our guests 13 comfortable, 2, 3, and 4 bedroom log-sided lake cabins complete with large decks and beautiful lake views. Take in the serenity of our park-like grounds as you step out of the hustle and bustle and back into the Minnesota resort vacations you remember from childhood. Renew your spirit and reconnect with friends and family in the private peacefulness of our secluded location. For the kids, our 300’+ sandy beach is immaculately kept, and provides the perfect place to relax and play. 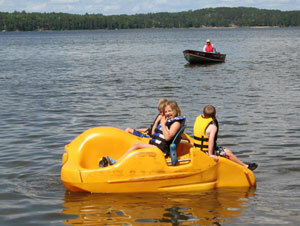 Guests have free use of our canoe, kayaks, hydrobike, pedalboats and stand-up paddleboards. Don’t forget the playground and volleyball/badminton area. We also have bocce ball, bean bag, and ladder ball sets for guest use. As your hosts, we promise you'll find Hidden Haven to be a premium family resort with our personal attention to cleanliness, friendliness and individual needs. During the summer season you can join us Thursday nights for some delicious, homemade cinnamon and sugar donut holes prepared fresh before your eyes. State Fair mini-donuts have nothing on us! The campfire will be going and you never know, some musician might lead us in some campfire songs!